With cooling temperatures, shorter days, and the crunch of fallen leaves, the setting couldn’t be better for a ghost story. MSU is over 160 years old and, as with any old institution, whispers of ghosts and satanic rituals have spread. At the MSU Archives, we don’t have official proof of spirits roaming the halls and dorms. You can believe the tales or not, but we can share with you the stories that have been told about the various spirts that haunt this university. The most famous ghost story on campus is the ghost of Mayo Hall, who people believe is Mary Mayo herself. Mary Anne Bryant was born in Calhoun County on May 25, 1845 and married Perry Mayo, a Civil War veteran, on April 14, 1865. They had two children together, a son named Nelson and a daughter named Nellie. In 1884, the Mayos were founding members of a chapter of the Order of Patrons of Husbandry, also known as the Grange. Within the Grange, Mary advocated for girls and women to better themselves and to receive the same education as the men. Even though women were admitted to MAC in 1870, the classes weren’t tailored to women; women were expected to work the land just like the men. Only a handful of women graduated from MAC during this time. In response, Mary was the main driving force for domestic science classes to be taught at MAC because she thought plowing and crop maintenance weren’t suitable for young women. Her persistence paid off in 1896 when 42 women enrolled in the new Home Economics Program, which was an instant success. Mary continued her work until she became ill in 1902; she died a year later on April 21, 1903. She is buried in the Austin Cemetery that is located in Convis Township, Calhoun County. room,” is rumored to be sealed off to students because of satanic rituals taking place and rumors of a woman hanging herself. None of these claims are true about Mary since she died at home from her illness in 1903. Also, she died 28 years before Mayo Hall was built in 1931. It seems very highly unlikely that Mary Mayo would haunt the building named after her years after her death, but many students believe that Mayo Hall is haunted. One of the most famous sites on campus, Beaumont Tower, also has its own ghostly stories to tell. One legend states you aren’t a true Spartan unless you have been kissed in the shadow of the tower. No reference as to how that legend got started has been found in the Archives. Another story involves the ghost of a student that was killed in World War II. He is said to haunt the tower as he searches for his lost sweetheart. It would make sense that the student was from World War II because Beaumont Tower wasn’t built until 1928, 10 years after World War I. Many students throughout the history of MAC have died in various wars, as far back as the first graduating class when two students died in the Civil War. If there is a ghost of a student haunting the grounds of Beaumont Tower, it would be difficult to know who the student was. Also, if a ghost is haunting Beaumont Tower, it could be a student that used to reside in College Hall, the first building on campus, since Beaumont Tower was built on the same location. Or it could just be people’s eyes playing tricks on them as they kiss in the dark beside Beaumont Tower. The most recent urban legend that affected MSU was back in 1998. That October, a rumor spread around campus that a psychic on “The Oprah Winfrey Show” predicated that a mass murder might occur on a college campus. This rumor was told a few different ways. The story that MSU believed was that a serial killer dressed as Little Bo Peep would appear on a Big Ten campus in Michigan on Halloween. The killer would murder around 20 people in a dorm located near railroad tracks with a name beginning with an “H.” Other versions claimed that the killer would be dressed in regular clothes, that the crimes would happen in a dorm shaped like an “H”, or that the building would be located near a cemetery. Most people believed that the prediction related to MSU because we are located in Michigan, we are a Big Ten University, Holden Hall starts with an “H”, is shaped like an “H,” and is located next to some railroad tracks. Of course, this rumor was just that – a rumor. This rumor has been around since 1968 and has resurfaced other times in various locations since it first appeared, the most recent at Kent State University in 2007. People believe that the rumor resurfaced again in 1998 because the movie Urban Legend was released on September 25 of that year. Some students were worried about staying on campus that weekend with some parents even calling the university. Needless to say, no murders happened that Halloween. There are many other ghostly and macabre stories about MSU. It is up to the listener to decide if they are real or not. If you do want to learn more about real grisly tales, the MSU Archives has some items in our collections to spark your interest. We have Spirit Communication letters in two different collections where “the dead” would communicate via a person and write out what they wanted to say, information on the real “Burning Bed” incident that was popularized as a TV movie starring Farrah Fawcett, a Halloween play that was performed on campus at the turn of the century, and more. You can read more about some of these grisly tales by reading some of our older blog posts or exhibit pages. No matter how you celebrate, whether by watching a scary movie, telling a ghost story next to a bonfire, passing out candy, or Trick-or-Treating, have a safe and Happy Halloween! And that rustling of leaves you just heard, it was just the cat…or so you think. Is there life after death? Can the spirits of our loved ones communicate with us from the great beyond? Spiritualism, the belief that the dead are able and willing to communicate with the living, was all the rage in 19th century America. Channeling, séances, and other purported methods of communicating with the dead were even quite popular in rural Michigan. Three separate collections in the MSU Archives contain spirit communications. Another example is a Spirit Communication notebook in the Samuel Johnson papers. The provenance of the notebook is not clear. It was, at some point, placed in the collection, but the names mentioned are not found elsewhere in Samuel Johnson’s papers. Most of the letters are written to Andrew and Jaime from various spirits, including King, and Jaime Peabody (both of whom seem to be some type of guardian), Charles (Pa), Mother, Grandma Lemon, and Jim. A medium, Mrs. Denslow, is responsible for most of the writings, although Andrew was being taught how to channel. The first few entries explain the importance of keeping Mrs. Denslow around because the spirits and mortals will be able to accomplish much through her. 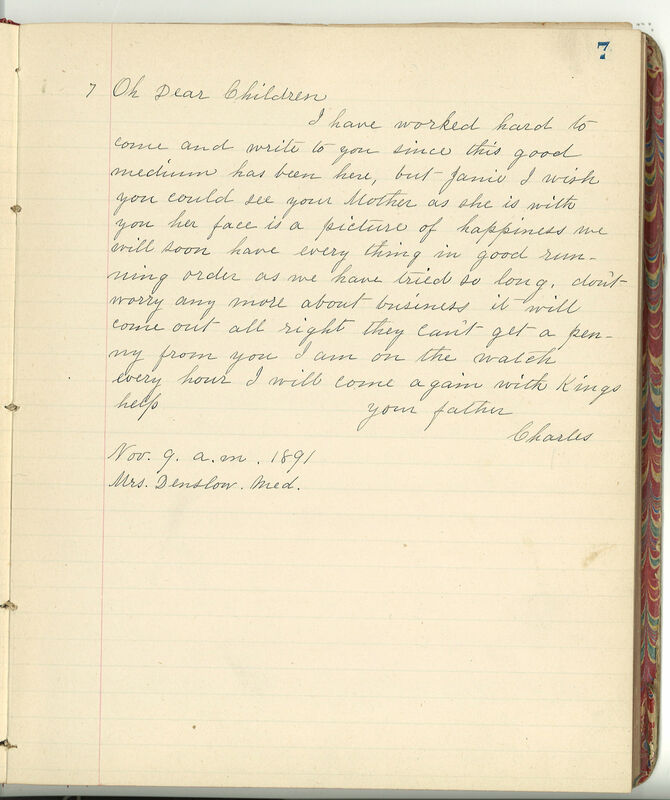 Clearly, their pleas were heeded, as Mrs. Denslow remained with the family from November 8, 1891 to April 23, 1892. 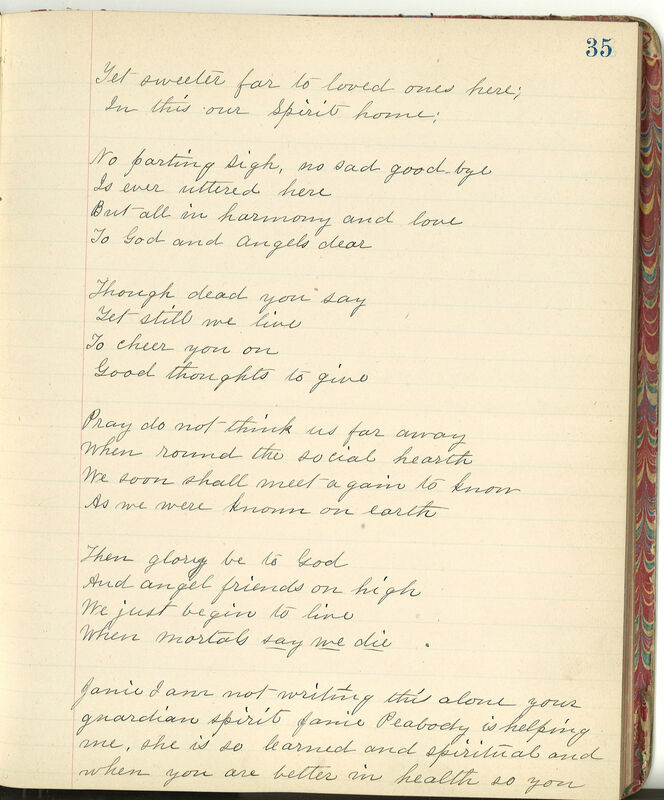 Mrs. Denslow used a technique called slate writing to commune with the spirit world. Two slates would be fastened together with the writing surfaces facing inward and a pencil would be placed between the slates. The medium and one of the family members would hold the slates while the spirit wrote its message. Once finished, the spirit would move the pencil out from between the slates. 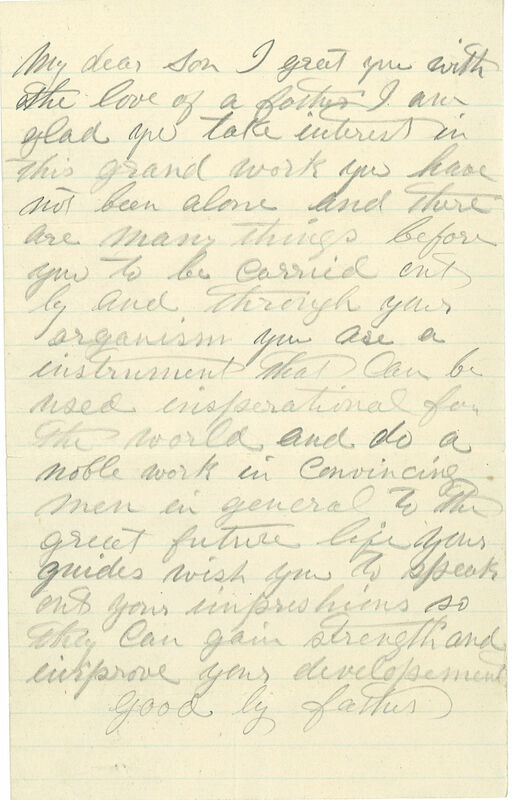 Jane B. Johnson then transcribed the messages, typically along with the date, time, and people present, into her Spirit Communication notebook. Despite Andrew’s training as a medium, once Mrs. Denslow left the household the spirit writings ceased. Both collections are open to researchers at the MSU Archives, along with stories of murder, mayhem, and betrayal. 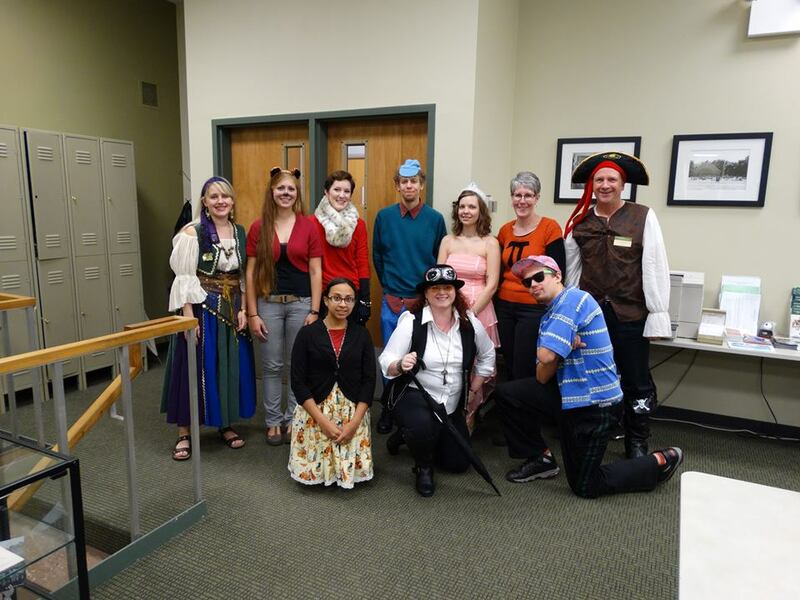 Happy Halloween from the MSU Archives staff! Boo! Did I scare you? With only a couple days left until Halloween, it seems that everyone has been double checking over their shoulders for movements in the dark and jumping at things that go bump in the night. While we can almost always blame these spooky moments on our own imaginations playing tricks on us, here at the archives we’ve been researching real life events that have the potential for the next scary movie to hit the theaters. 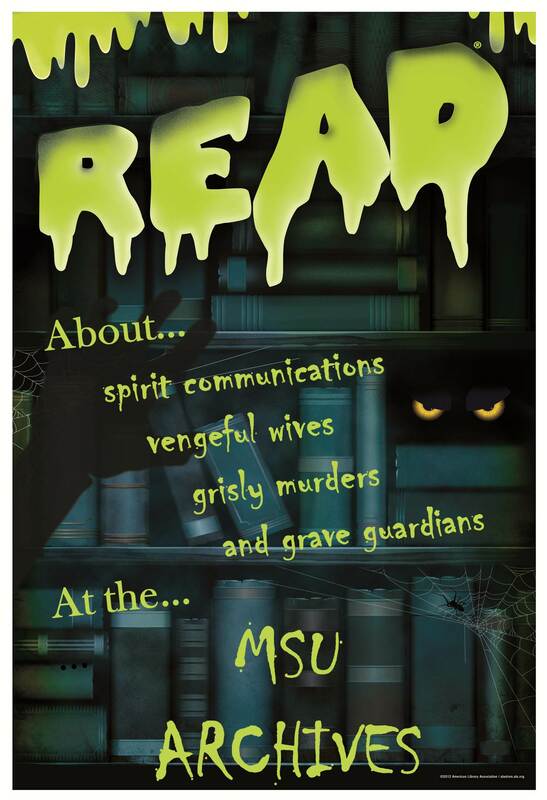 From spirit communications to grisly crimes, from vengeful wives to grave guardians, the MSU Archives has information on all sorts of thrilling stories, so if you’re looking for a good scare this Halloween season, be sure to stop by and do some of your own research. On the evening of March 9, 1977, while MSU students were studying for upcoming exams and goofing off in their dorm rooms, Francine Hughes, a resident of Dansville, MI, arrived at the Ingham County Sheriff’s Department crying and rambling about setting a bed on fire. It wasn’t long until the whole story had come out – that night Hughes had put her four children in the family car, poured gasoline in a circle around the bed her husband was sleeping on, ignited the gasoline, and sped off to the jail, with her children in tow. The police department, taking action immediately, confirmed that the house had been set ablaze, and that Hughes’ husband had been found dead on the floor outside of the bedroom that the married couple had shared. 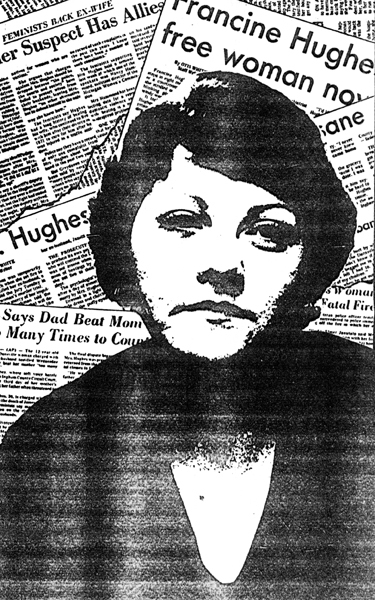 Later investigations uncovered the fact that Francine Hughes had been brutally abused by her husband, James Hughes, both physically and emotionally for years. She had divorced him, but pressure from his family to return and care for him after he had experienced a bad automobile accident was overwhelming, and she gave in. Years later, after suffering the continuing abuse, she got her revenge. Hughes was found not guilty by reason of temporary insanity. Her story was turned into a book and a TV movie starring Farrah Fawcett. “The Burning Bed” helped raise awareness about domestic violence. Vengeful wives aren’t the only topic of spooky interest at the MSU Archives. 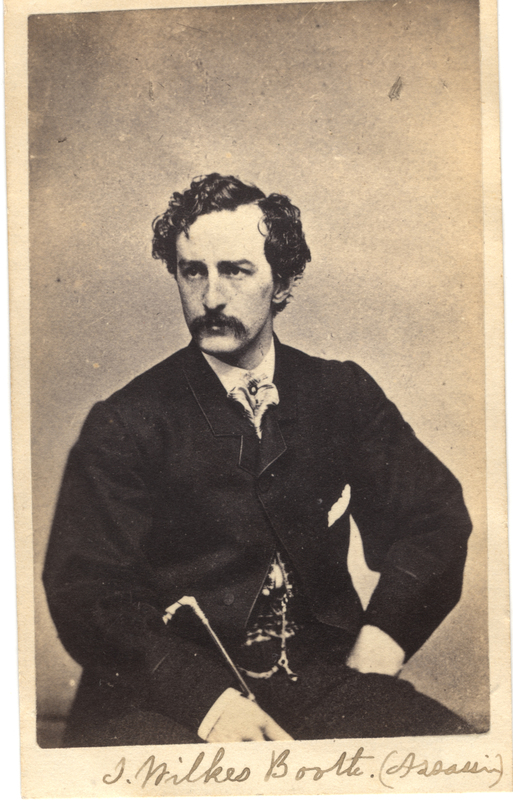 In fact, the MSU Archives has the first hand account of James L. Lucas, who had been a special body guard for the corpse of John Wilkes Booth, the assassin of Abraham Lincoln. He recounts the body of Booth, after he had been shot on the morning of April 26, being taken onto the USS Montauk. The blankets in which the body had been wrapped were soaked in blood, and his face was coated in dust from the long journey to the Potomac. Lucas, along with three other soldiers, were to watch over the body in secrecy, to make sure no sympathizers got word of where the body was being kept. They were given instructions to fire at any boat that attempted to rescue the body. Later, he recounts, the body was then buried in the Old Penitentiary in the capitol. He refers to the job as a “distasteful duty,” as anyone having to watch over a corpse would. Looking to read more about either of these stories? Take a visit to the MSU Archives and learn more about how Francine Hughes’ took her husband’s life or how James Lucas had to watch over the dead body of the the killer of one of the most well known presidents of America. In fact, the archives has plenty more gory, grisly stories like this, and with only a couple days left until Halloween, come get in the mood for this spooky day and read some more real-life horror stories.